E-pistle 2007/031 – Does your glass affect your dram? You are well on your way to malt tragicdom, when you actually start to think about the glassware you use when you choose to have a whisky and whether you make a decision to discriminate between how you serve a malt and how you serve a blend. In a philosophical sense you’re looking at whether form follows function and whether form can augment function. I mean people argue that way about any article designed for use by humans from hand held blenders to automobile seats and on a macro scale about built spaces from buildings to cities, so why not the glass in which you serve your malt whisky. I suppose there are two very basic questions that anyone should ask. Does the glass matter and if it does, why is that the case? Or is there any rational reason why it should? Do you pay any attention to the glassware you choose when you come home from work and pour yourself a pre-prandial dram or even a digestif? And does it really matter what glass you nose and taste from? 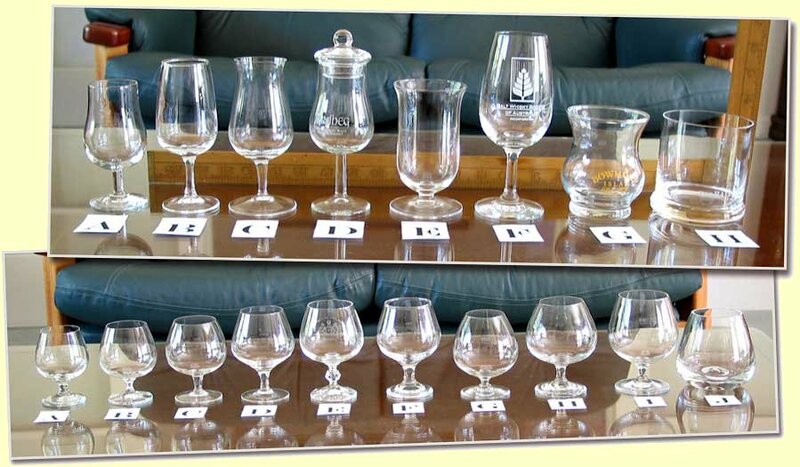 Depending on your purpose you may choose a different glass for judging & evaluation than for enjoyment. Basically the theory is the same – you need a glass that has a bowl shape – this does two things the bowl allows the spirit to have a big exposure to air and to trap the volatiles that come off first and fast so you can smell them before they dissipate into the ambient atmosphere. Traditional whisky tumblers are primarily designed to reduce the nose on a whisky and work well with a blend with water or soda. They are primarily designed for a relatively long drink rather than to enhance the evaluation. 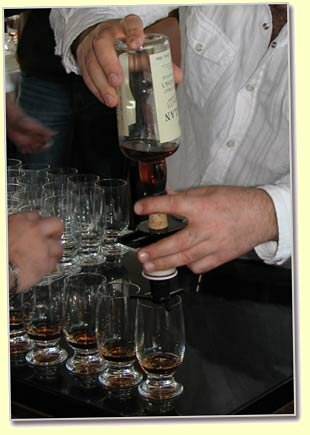 Some also believe that the straight sides are about allowing the aromas to dissipate quickly which would make sense if you’re trying to hide a relatively poor spirit, which was probably the case in Prohibition days, but is counter-productive if you’ve spent $100 or more on a good single malt and want to savour the experience. As you can see from the photos below, I have a whole stack of different glasses. I find myself drawn to a small core which I find useful. In the accompanying photos my favourite glass for enjoyment is the Photo 2: Brandy Balloon Glass D which is light, a nice size, good quality with a nice fine rim and affords a reasonable sensory experience with 30ml or so. For this reason, I very rarely use any of the big balloons for anything as it’s too easy to pour yourself a triple without intending to. As I do a lot of my malt judging with 10-15ml (both your nose and palate get tired after even a small amount of alcohol so if you’re evaluating 8 whiskies in a session using a smaller glass makes sense, I use a small brandy balloon (Photo 2 Glass B) or the Glenmorangie/Ardbeg glass (Photo 1 Glass D) as it delivers a reasonable surface area to volume ratio but doesn’t let the spirit dissipate too quickly. The little lid is useful if evaluating 6 to 8 whiskies at a time as it allows focus on the whisky in hand without other vapours intruding. I use the small balloons for the Malt Maniacs Awards primarily because I have enough to be able to put 10-12 whiskies on the table at one time. So basically any glass that has a narrower opening than the diameter of the bowl should work; the rest is personal preference. The slightly flared lip on the Riedel glass and the Australian Brandy snifter gives good palate delivery, but the straight sides on the Riedel doesn’t really produce the concentration of aromatics in the head space of the other more efficacious styles. I want a glass that will give me a reasonable surface area to volume ratio so the whisky doesn’t go flat too quickly and allows the volatiles to come off relatively slowly. Then I like it to feel good in the hand and thirdly it should have a nice fine rim for improved palate delivery. B ~ Arcoroc Viticole Sherry Copita (4 fl oz) – SMWS (Australia) glass – makes a half nip look like a decent drink. Works well with OP’s. C ~ Australian style brandy snifter with flared lip (125ml) – Works well all round, very solid performer especially for evaluation. Rank 1. D ~ Ardbeg/Glenmorangie style tulip with straight chimney opening (120ml) – lid is a bonus when evaluating lots of whiskies. Rank 2. E ~ Riedel malt whisky glass 12 fl oz 200ml – lip is good for delivery, but nose is let down by lack of headspace Rank 5. F ~ ISO wine taster – ranks after C & D/A. Rank 7. G ~ Bowmore thistle glass – OK but 15ml of spirits gets lost – better for recreation rather than evaluation. H ~ Balvenie straight sided tumbler – befits whisky and soda. A ~175ml crystal – nice but too dinky. B ~ 190ml crystal – my preferred choice for blind evaluation Rank 4. C ~ 210ml glass – does a job but not a favourite. D ~ 240ml crystal (not sure of the brand – looks like a mini Bormioli or Schott Zweisel) my favorite dramming glass at home Rank 3. E ~ 250ml crystal (Bohemia Claudia 22% lead crystal) – Earls of Zetland Trophy glass – good but a bit clunky. F ~ 280ml glass – too chunky and I hate the rim. G ~ 300ml crystal – very nice bowl shape and works very well for nosing but the short stem is a trap for fingers. H ~ 350ml glass – too clunky. I ~ 390ml crystal – OK but too big for everyday purposes. J ~ 400ml glass – David McCoy “The Scotch Doc” glass. Weighs a ton and I hate the wide lip. Not used for evaluation or recreation. Apart from the Riedel, Balvenie tumbler, Bohemia Claudia and Arcoroc Viticole, all the others were purchased in second hand and “opportunity” shops. I would spend at least three Saturday mornings a year scouring these places for little brandy balloons and any of the snifter style glasses.